Dr Gore the host of the night is a horror magician, sideshow performer, voodoo practitioner, a self styled medical expert and has a taste for human flesh, not to mention his other predilections, but we don’t talk about them. 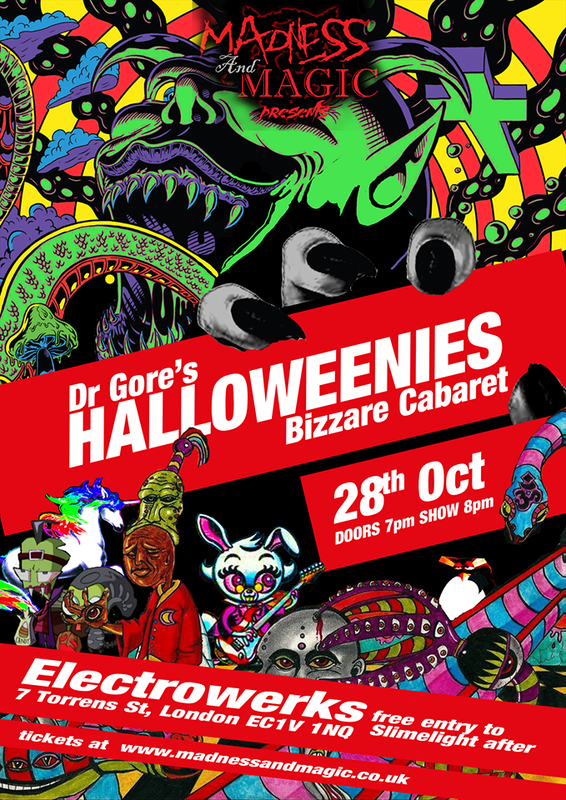 He made a bloody splash on the first season of Britain’s Got Talent when he was banned form the semi finals by OFCOM for giving children nightmares, however as you are all adults, be brave and come down to Dr Gores Halloweenies and expect the unexpected. From lecturing the methodology of cinematic serial killing to bringing his dismembered pets onto stage, Neuroses is a highly unpredictable stage presence. His stories unravel preposterous circumstances and surreal environments, simultaneously crossed with the bitter honesty of human nature. An act with a writing style blending P.G. Wodehouse and Hunter S. Thompson (he likes to think), Neuroses offers a practically unique stand-up experience. Most people keep their neuroses on the inside; he wears his on his face. Hey kiddies, introducing you to some insane sideshow performers. Chris Douglas and Adam Evans are 2 maniacs that don’t know the meaning of the words too far. With death defying feats of sideshow, and a very wild nature, this team of world record holders in sideshow will awe you with feats few men would consider let alone perform. Prepare yourself for fiery sensation to rock your senses. Due to Nick Sick handing over the reigns for this event, we have a special guest compere for the nght. So come to Dr Gores Halloweenies and find out what manic Dr Gore found for you all.